The unique characteristics of our aquatic environments. 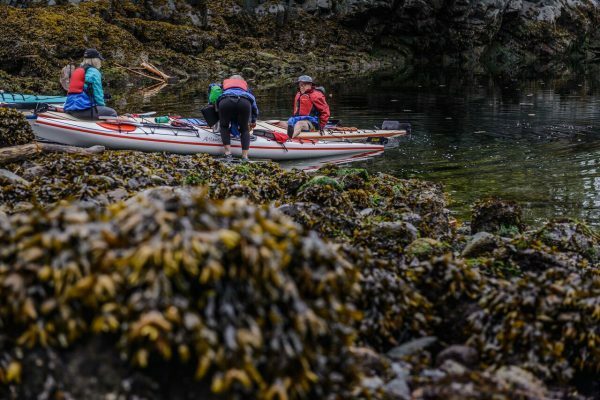 Many people come to kayak on northern Vancouver Island in hopes of seeing wildlife. We are frequently asked questions about sea-dwellers (such as whales, dolphins, and seals) and landlubbers (like wolves, bears and eagles). But what many fail to appreciate ahead of time is the vast diversity of life found in the intertidal zone. Our hope here is to shed some light on this incredible ecosystem and help others understand why we find it so fascinating! The intertidal zone is where the land and ocean meet; the section of the shoreline that is exposed to air at low tide, and covered by the ocean at high tide. 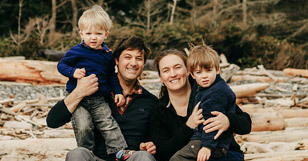 This area can include steep rocky cliffs, sandy beaches, or vast mudflats. WHAT IS IT LIKE TO LIVE IN THE INTERTIDAL ZONE? The marine plants and animals that live in the intertidal zone are well adapted to survive in this challenging and constantly changing environment. Those with similar tolerances to the stresses of intertidal life form distinct communities or bands between the high and low tide lines. Stresses may be caused by non-living parts of the environment, including lengthy exposure to the air at low tide, large fluctuations in temperature and exposure to salty ocean water, and turbulence from wave action. Other stresses are caused by living parts of the environment and include predation from land animals at low tide, exposure to marine predators at high tide, and competition with other intertidal species for space and food. Inhabiting the intertidal zone can be a delicate balance between these stresses with upper limits being determined by the need to be underwater in order to feed and respire, and lower limits by the need to escape from marine predators. 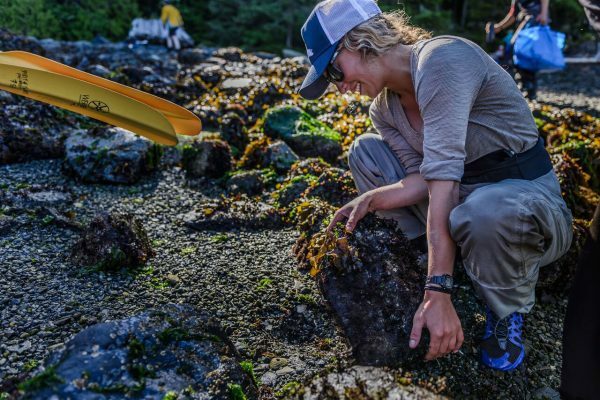 While the intertidal ecosystem presents many environmental challenges it also supports a rich and diverse community of marine plants and animals. Different species have different adaptation strategies that allow them to thrive in this environment. Crabs, snails and other mobile species are able to hide under rocks or seaweeds to hide from the sun and keep from drying out. Barnacles and mussels are able to close up tightly during low tide, holding a small reservoir of seawater inside their shells. Kelps attach to the shoreline with strong holdfasts and sea stars have a tough leathery surface, and thousands of tiny suction cups on their undersurface, that allows them to endure extremes in wave action. WHY IS THE INTERTIDAL ZONE IMPORTANT? The intertidal zone is important for both marine and terrestrial wildlife. Many species of bird and animal such as bears, wolves, otters and deer forage in the intertidal zone during low tide. Intertidal animals and plants provide an important food source for people, both past and present, who harvest oysters, clams, mussels, crabs and many seaweed species. The intertidal zone acts as a nursery ground for many deep water marine species, providing both shelter and food during the vulnerable early life stages for many organisms. Intertidal species are a critical link in the marine food web and an important indicator of the overall health of the marine environment. You can learn more about the plants and animals of the intertidal zone by visiting local beaches and quietly observing tide pools when the tide is out. When tide pooling, be sure to check a tide chart before you go and be respectful that the ocean is powerful and sometimes dangerous. You may want to take a guidebook and camera with you to research and document what you find. Please use proper etiquette; watch your step and avoid trampling or crushing the animals which call the intertidal zone home. If you move a rock or a piece of seaweed to see something more clearly, put it back when you are done as many of the organisms in tide pools will die if they are exposed to prolonged sunlight. Looking at intertidal life can be a great introduction to nature for younger people, or just an interesting and fun way to spend a few hours in the outdoors.